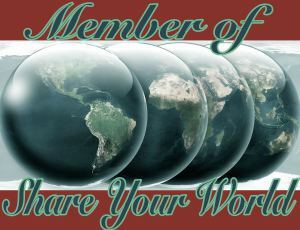 It’s time for Share Your World, a weekly series hosted by Cee over at her photography blog. Let’s dive straight in! Yay, shopping! Hunting around for a parking place. Traipsing around a busy town. Pushing my way past a billion people. Basking in the noise. Breathing in the fumes. No, wait. That’s not right. I’m changing my answer to “going to a park”. It’s been years since I went bowling. I can’t handle the (real or imagined) smug looks on other people’s faces as my ball consistently falls in the gutter. Plus it’s very expensive, like £4 per person per game. What’s the single piece of advice you wish someone had given you a year — or five, or ten — years ago? “Fasten your seat-belts. It’s going to be an exceptionally bumpy ride. Actually, you might also want to wear body armor and a helmet. Thanks oh mythical Grandfather for your wise counsel. I’ll get right on it!